Just over seven months into the lifetime of FitzGerald coalition government, a dispute over children's shoes caused another general election. As part of a Budget designed to combat the worsening economic situation, Finance Minister John Bruton proposed in January 1982 that VAT be put on children's shoes and clothes. This controversial policy was opposed by the Democratic Socialist TD Jim Kemmy, who voted against the Budget. Without his support, the coalition experienced a loss of supply, and FitzGerald announced his intention to ask President Patrick Hillery to dissolve the Dáil and call a new general election. Due to a delay caused by President Hillery's secretary being absent, it was a number of hours before FitzGerald was able to meet him. In this time, telephone calls were made to the Áras by Opposition leader Charles Haughey and members of his front bench seeking to request that the president refuse a dissolution, thus necessitating FitzGerald's resignation and enabling Haughey to form a government without an election being called. President Hillery refused to take the calls, considering Haughey's attempts to influence his decision unconstitutional and disrespectful. FitzGerald's request was granted and a general election was called for February. The economy featured heavily in the campaigns of both parties (the Labour Party campaigning alongside Fine Gael as coalition partners). Regardless of who won spending cuts had to be made, though neither party wished to admit how severe these cuts could be. The coalition fought on their record of the past eight months and promised to reduce Ireland's foreign borrowing from the levels it had risen to under the previous Fianna Fáil administration. Fianna Fáil argued that they were the better party to provide stability, and attempted to portray the coalition as too austere in their economic proposals. The tone of the campaign was illustrated by the slogans used by each of the two parties. Fine Gael, banking on the personality of FitzGerald, told voters "he puts the nation first". Fianna Fáil meanwhile promised that "we do a better job." In the end, the election saw only small changes. Fine Gael lost two seats, while Fianna Fáil picked up four. For the second time, Labour's total remained unchanged at 15 seats. The overall left wing vote saw a slight increase, as the Workers' Party returned three seats, up two from 1981, while Kemmy held his seat in Limerick East under his new Democratic Socialist Party. For the second time in a year, the election saw no clear winner. 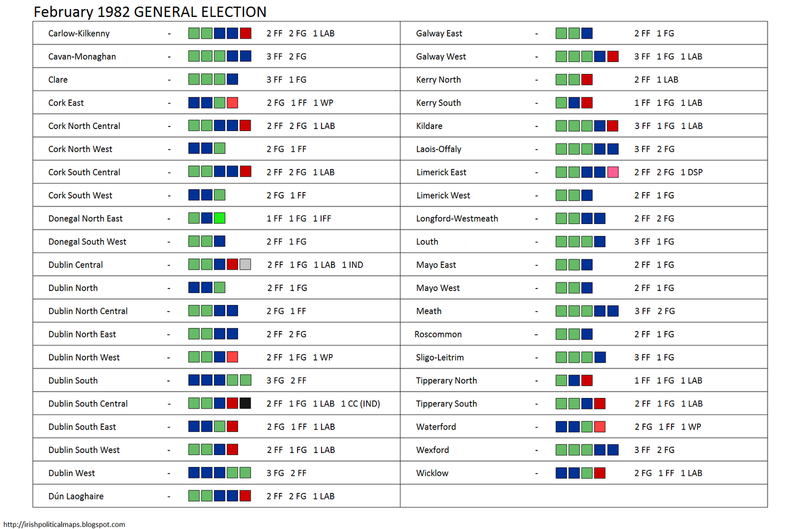 Neither Fianna Fáil nor the outgoing coalition had enough seats to form a majority, and so the victor would be chosen by the smaller parties and independents. Charles Haughey immediately set about courting these TDs. He could count on the support of Independent Fianna Fáil TD Neil Blaney, and was also able to win the support of the three Workers' Party TDs. In an unprecedented move, Haughey secured the vote of newly-elected Independent TD Tony Gregory with a £50 million deal for Gregory's Dublin Central constituency. Haughey now had all the support he needed, and was duly elected Taoiseach when the 23rd Dáil met on March 9th. After just eight months of rule by the Fine Gael-Labour coalition, Ireland found itself once again with a Fianna Fáil government. The economic policies of Haughey's previous tenure had resulted in many problems for the Irish economy. It was now up to him to deal with these problems, but with a minority administration and only conditional support from left-wing TDs, not to mention consistent unrest within Fianna Fáil regarding his leadership, he faced political instability as well as economic. One wrong move could bring down his government and result in yet another general election.